Accra, Dec. 3, GNA - President John Agyekum Kufuor, presidential candidate of the New Patriotic Party (NPP), who is seeking re-election, was born on December 8, 1938, at Damang in the Ashanti Region. He entered the Lincoln Inn, London, where he obtained a degree in Law in 1959 and Oxford University in United Kingdom from 1961 to 1964, where he obtained his second degree. President Kufuor started his working career as a Kumasi-based private Legal practitioner from 1965 to 1969. He was City Manager and chief legal officer of the Kumasi City Council from 1967 to 1969. He was a member of the Constituent Assembly that wrote the 1969 Second Republican Constitution and the Progress Party's MP for Atwima Nwabiaga constituency from 1969-72. He was appointed Deputy Minister of Foreign Affairs in the government of the late Dr Kofi Abrefa Busia, who governed from 1969-72. President Kufuor also served on a number of Boards, including the chairman of the Board of Directors of Ashanti Brick and Construction Company, as well as Cojak Company Limited between 1973 and 1978. He was again a member of the Constituent Assembly that wrote the 1979 Third Republican Constitution and he entered parliament for the Atwima Nwabiaga constituency on the ticket of the Popular Front Party (PFP), a successor to the Progress Party. He was the Deputy Leader and spokesman for the PFP on Foreign Affairs. In 1982 he was appointed the PNDC Secretary for Local Government but he resigned after a few months. President Kufuor was the chairman of Asante Kotoko Football Club from 1988 to 1991. In 1992, he contested the NPP's presidential slot, which he lost to Professor Albert Adu Boahen. He again contested the party's presidential slot in 1996, which he won and led the Great Alliance, which comprised the People's Convention Party (PCP) and NPP. He lost to former President Jerry Rawlings. President Kufuor was chosen for the second time by his party as the presidential candidate to contest the vote in 2000, which he won. 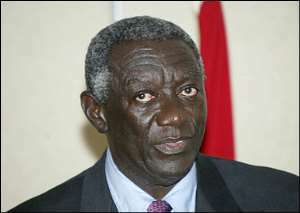 President Kufuor was given the nod for the third time to contest the 2004 vote. He is married to Theresa, a nurse/midwife, who was born on October 25, 1935.